Morris Crane Systems is a European company founded all the way back in 1884 by Herbert Morris. Today they are owned by Konecranes and are a well-known manufacturer of high quality hoists. We were asked to develop a new website for them in China to display their products for the local market. 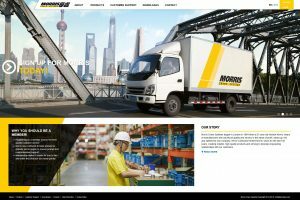 We also developed a custom Order Tracker system for Morris’ Sales Managers and their customers to handle the entire, complex ordering process with automation for online-to-offline (O2O). The website and backend were developed in Drupal.